The buns are free-range and litter-trained. They have a whole bedroom to themselves filled with cardboard box castles, plastic tunnels, rugs for digging, chew toys, and chewable-things-that-are-not-supposed-to-be-toys-but-get-chewed-anyway. Aphrodite (Nicknames: Doodle, Aphie; Age: 7; Named by K) is a blond mini-lop and a straight-up diva. She was an only bun for her formative years and the first bun that K or W ever owned. She showed us that bunnies are like little dogs–a lot of work, terrible destroyers of property, demanding of attention, and full of love for their humans. After she and Gandalf finally bonded (it took almost a year), she decided he was her best friend and bun-servant. When Aphie wants to be groomed, she pushes her head under Gandalf’s until he commences with the grooming. 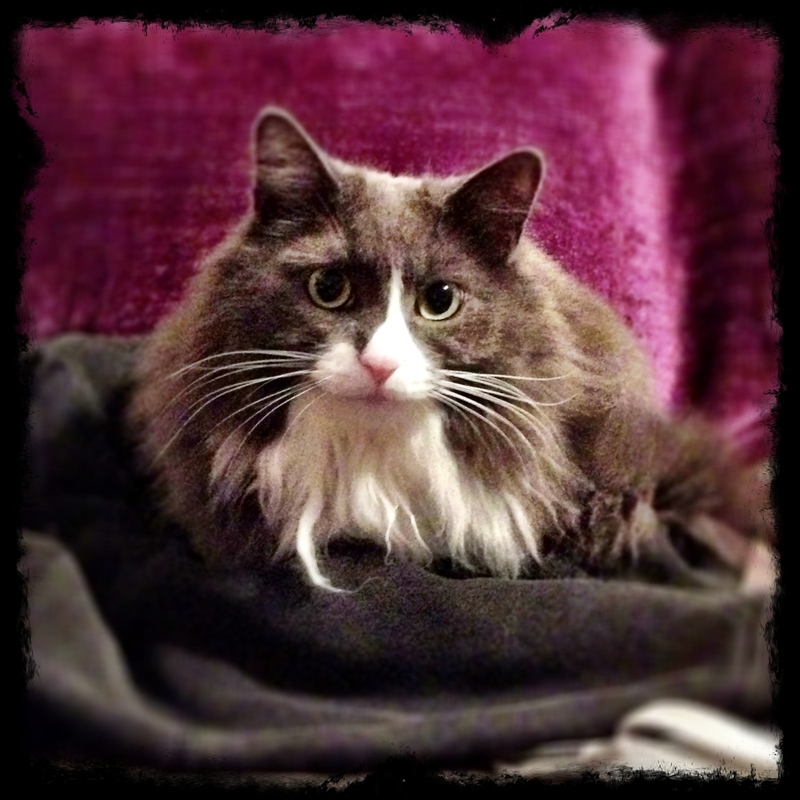 She is not afraid to boss her human companions around, too, with a firm headbutt to the ankle. Unlike most buns, she will snuggle on your lap for a full hour. But don’t forget that she is an independent bun. RESPECT. Her favorite treats are banana and baby carrots. Gandalf (Nicknames: Gandy, The Feral Bun; Age: 4.5; Named by W) is as cute as he is simple. Named for his luscious wizardly locks, he is a handsome and flamboyant lion head boy bunny. He is a member of the local beardsman club. We adopted him from Lollypop Farms as a companion for Aphie, but they refused to get along for the first year. When we finally moved homes, we tried again and now they are inseparable. Gandy never really got comfortable being handled by his humans. He hates being picked up, but he will sometimes accept pets on his head and ears. We sometimes have to cut his beautiful beard because it gets tangled in knots. He loves Aphie with all his little bunny heart. We can’t tell if they are just best friends or bun-loves, but they love to snuggle each other. He really loves chewing and throwing his little wooden toys and hiding in boxes. He will cautiously stick his face out a box “window” for treats, his favorite being dehydrated strawberries and parsley. New things baffle and challenge him, so we try to keep new foods to a minimum with this funny dude. The wiggles are an odd couple that live in a 13.5 square foot open-top C&C cage. They are in the same bedroom (dubbed the Bun/Wiggle Room or the Zoo) as the bunnies, but elevated on a folding banquet table. They are more like roommates than siblings or besties. Sometimes you get annoyed because your roommate forgets to do the dishes, but it’s nice to have someone to watch TV with and split bills with. They love peppers. So much. They turn into little pepper monsters and freak out about their peppers every night. 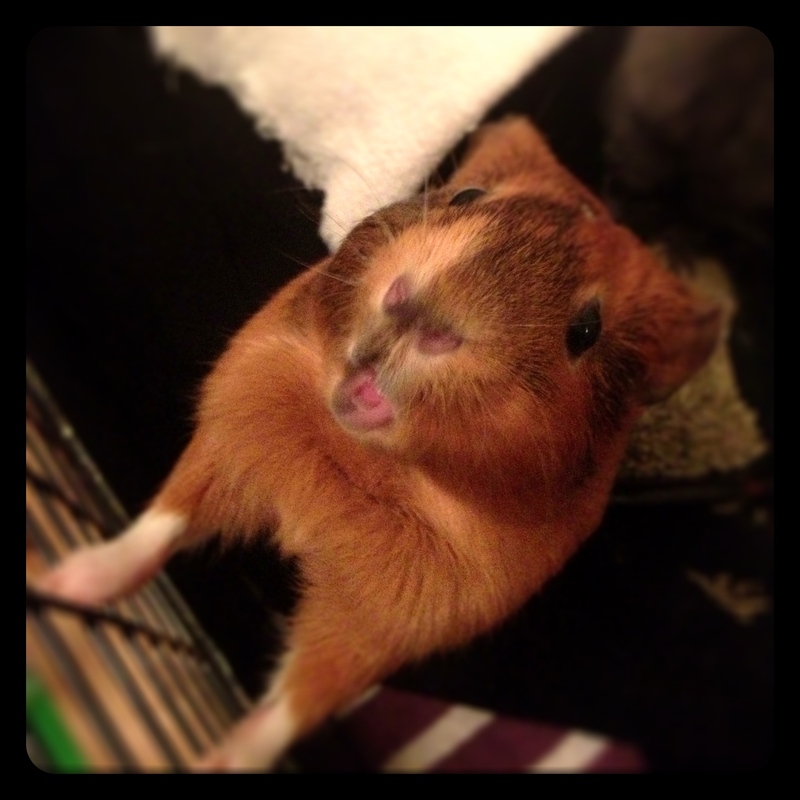 Persephone (Nicknames: Persy, Persy Pig; Age: 5.5; Named by K) is the elder pig of the pair. She and her bonded sister, Julio (W named Julio, too) were brought home together and lived together until Julio unexpectedly passed in 2010 at the early age of 2. Persephone grieved and grieved, spending most nights on K’s lap after Julio passed, but K wasn’t enough. They didn’t speak the same language. Persy was the submissive pig. She needed a little piggy leader/friend to keep her company. That’s how we came to adopt Snuggles. Persy is a teddy bear pig and her agouti fur is coarse and lovely. She loves to jump headfirst into a pile of fresh Timothy hay. She also enjoys playing follow-the-leader (she follows) and nomming on cardboard paper rolls. If you pet her belly just right, she’ll pop one back leg into the air and fall happily onto her side. She is too old for pop-corning now, but she loved to go dashing around popcorning when she was a babe. Her favorite treats are grapes and cherry tomatoes. Snuggles (Nicknames: Snuggs, Red/Little Brick; Age: 3; Came with name) ironically hates snuggling. She was the only female pig at Lollypop when we were looking for a new companion for Persy. She had behavioral issues, so the staff were working with her, but she wasn’t available for adoption yet. She was very territorial and not trusting of people and would lunge at you if she felt threatened. When we met her at the adoption center, she immediately ran towards K, climbed K’s scarf, and put her chin up to K’s chin. This is pig language for, “Who’s the boss? I’m the boss.” The staff were nervous, but K stood still until Snuggles calmed down. It turns out, Snuggles just needed a loving home and a little understanding. 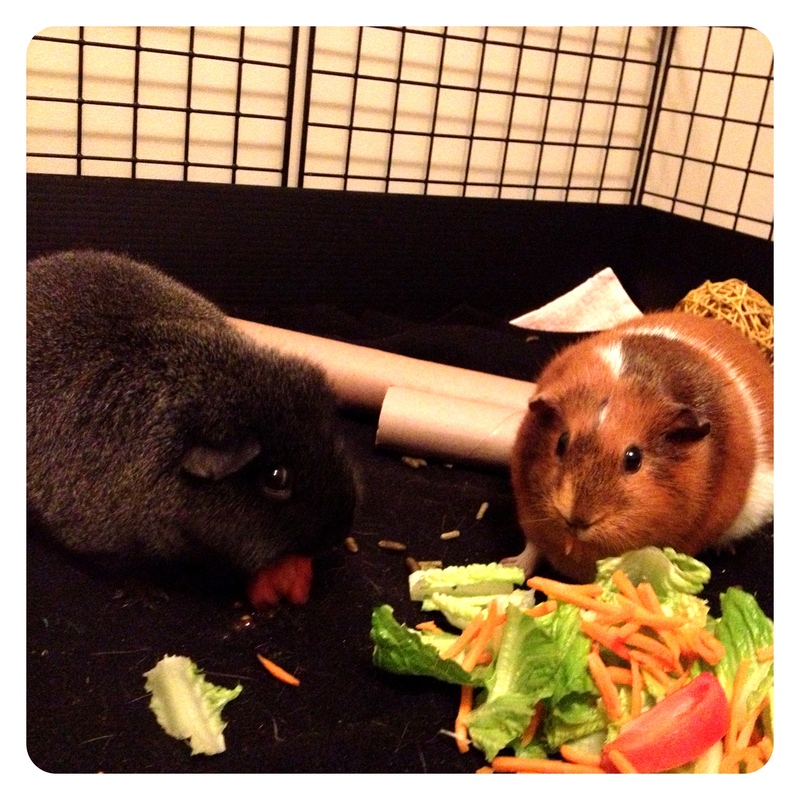 K oversaw the bonding and within a month, Persy and Snuggs were living together and sharing lettuce. Snuggs has come to accept limited human affection and seems to enjoy when we rub her ears. She still has an attitude problem, but we like her that way. 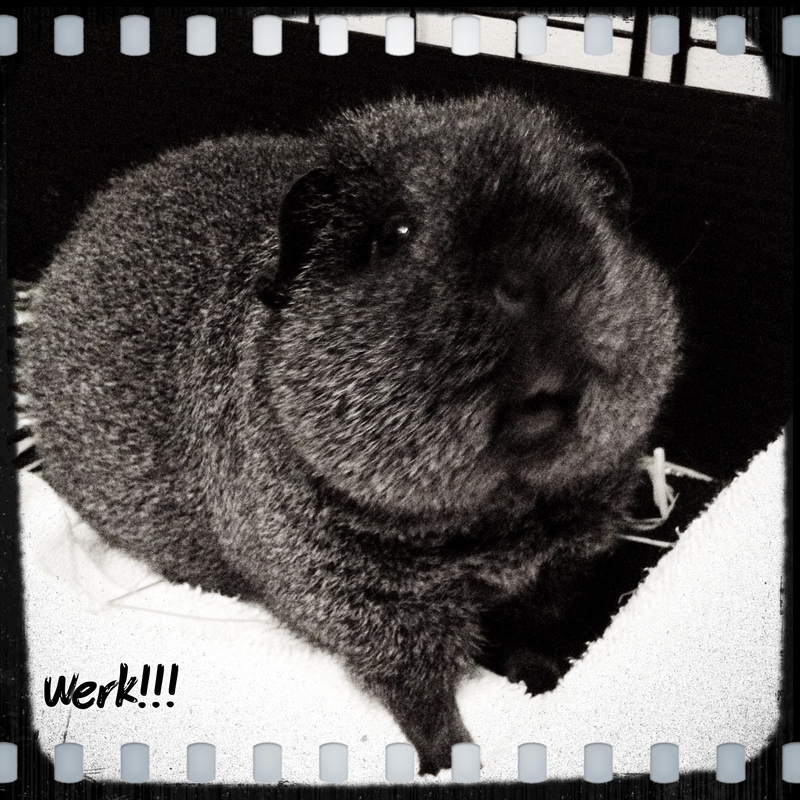 Her food wheek is piercing. We are working on getting her to accept being pet gently on the top of her back. She loves to burrow completely under fleece or towels. Her favorite treats are apple slices. Jeter (Nicknames: see above; Age: 5; Came with name) is a lover. So much love. His favorite human is W, but he will grace K with some cuddles and love if W is unavailable. He is also high anxiety about other pets and people. He will always be an only cat, though he is slowly getting more bold around visitors. He loves toys that he can pick up in his mouth and carry around. He prefers trash to actual fancy cat toys. His favorite toys are pull tabs from cardboard boxes, plastic bags that he steals from all over the house, those plastic packing bags with air in them for shipping, scratchy boxes, and anything that makes moving light or shadows. He has cat pica (It’s a real thing.) and eats fuzz and hair whenever he can get to it before we do. He eats too fast and ends up making himself sick, so we have to feed him wet food in small servings every few hours and make sure he has dry food all the time. He is really serious about using the litter box and covering and re-covering and re-covering his eliminations. Did I mention he is high anxiety? He loves to snuggle under the blankets with you, drools when he is really happy, and is afraid of us when we wear shoes in the house. His belly is the fluffiest. Neither W or K like baseball much, but he is highly intelligent and knows his name, so we decided not to change it when we adopted him. His favorite treats are these gross dehydrated shrimp things. Eww. We think pets will always be a part of our family, regardless of how many humans are in the home. We are looking forward to having a kid and pets at the same time, even though it’ll be a lot of work. Studies have shown that children build empathy and compassion by interacting with pets. We hope to pass our love of all things furry and cute to our future offspring. Do you think pets add value to your family? ← I really don’t want to be a mommy blogger. Even a queer one.